A painting of Cahokia Mounds State Historic site by William R. Iseminger. Horseshoe Lake, where core sediments give a timeline of flooding from the Mississippi River, can be seen in the upper left. As with rivers, civilizations across the world rise and fall. Sometimes, the rise and fall of rivers has something to do with it. At Cahokia, the largest prehistoric settlement in the Americas north of Mexico, new evidence suggests that major flood events in the Mississippi River valley are tied to the cultural center’s emergence and ultimately, to its decline. Publishing May 4 in the Proceedings of the National Academy of Sciences, a research team led by UW–Madison geographers Samuel Munoz and Jack Williams provides this evidence, hidden beneath two lakes in the Mississippi floodplain. Sediment cores from these lakes, dating back nearly 2,000 years, provide evidence of at least eight major flood events in the central Mississippi River valley that could help explain the enigmatic rise and fall of Cahokia, near present-day St. Louis. While the region saw frequent flood events before A.D. 600 and after A.D. 1200, Cahokia rose to prominence during a relatively arid and flood-free period and flourished in the years before a major flood in 1200, the study reveals. That was also a time of political instability and population decline. Two hundred years later, Cahokia was completely abandoned. While drought has traditionally been implicated as one of several factors leading to the decline of many early agricultural societies in North America and around the world, the findings of this study present new ideas and avenues for archaeologists and anthropologists to explore. “We are not arguing against the role of drought in Cahokia’s decline but this presents another piece of information,” says Munoz, a Ph.D. candidate in geography and the study’s lead author. “It also provides new information about the flood history of the Mississippi River, which may be useful to agencies and townships interested in reducing the exposure of current landowners and townships to flood risk,” says Williams, a professor of geography and director of the Nelson Institute for Environmental Studies Center for Climatic Research. Munoz didn’t set out intending to study flooding. His findings were “kind of an accident,” he says. Originally, Munoz was looking for the signals of prehistoric land use on ancient forests. He chose to study Cahokia because it was such a large site and is famous for its large earthen mounds. At one point, tens of thousands of people lived in and around Cahokia. If there was anywhere that ancient peoples would have altered the landscapes of the past, it was Cahokia. The team went to Horseshoe Lake, near the six-square-mile city’s center, and collected cores of lake mud — all the stuff that settles to the bottom — to look for pollen and other fossils that document environmental change. Lakes are “sediment traps” that can capture and record past environmental changes, much like the rings of a tree. At Cahokia, Monk’s Mound, the largest earthwork built north of Mexico prior to the arrival of Europeans. They asked around, talked to colleagues, and checked the published literature. The late Jim Knox, who spent his 43-year career as a geography professor at UW–Madison, suggested to Munoz that he think about flooding, which can disrupt the normal deposition of material on lake bottoms and leave a distinct signature. The team used radiocarbon dating of plant remains and charcoal within the core to create a timeline extending back nearly two millennia. In so doing, they established a record of eight major flood events at Horseshoe Lake during this time, including the fingerprint left by a known major flood in 1844. To validate the findings, the team also collected sediments from Grassy Lake, roughly 120 miles downstream from Cahokia, and found the same flood signatures (Grassy Lake is younger than Horseshoe Lake, so its sediments captured only the five most recent flood events). The new findings show that floods were common in the region between A.D. 300 and 600. Meanwhile, the earliest evidence of more agricultural settlement appears along the higher elevation slopes at the edge of the central Mississippi River floodplain around the year 400. But by 600, when flooding diminished and the climate became more arid, archaeological evidence shows that people had moved down into the floodplain and begun to increase in population and farm more intensively. “Rarely do you get such fortuitous opportunities where you have these nice sedimentary records next to an archaeological site that’s so well studied,” says Munoz. Early on in the study, Munoz and Williams enlisted the help of Sissel Schroeder, a UW–Madison professor of anthropology whose doctoral studies focused on the Cahokia area. Schroeder accompanied the Geography Department scientists out in the field and helped provide historical and archaeological context. She explains that while there has been little archaeological evidence to suggest flooding at Cahokia, it can’t be ruled out. It’s possible, she says, that researchers have simply missed the signals. For example, archaeologists know that around the year 900, people in the area began to cultivate maize and their population exploded, shown by the number and size of buildings and structures that sprang up in the region. Archaeologists often think of Cahokia as a chiefdom, with a hierarchy of smaller settlements that spread out from the city, much like the small county seats that surround the major government centers we’re familiar with today, Schroeder explains. But around 1200, coinciding with a major flood fingerprint in Munoz’s sediments, the population began to decline along with other shifts in the archaeological record. Cahokia appears to have fractured and its people began to migrate to other parts of North America. By 1400, after the arid conditions that suppressed large floods and favored Cahokia’s rise had passed, it was deserted. While many factors likely contributed to Cahokia’s decline — from extreme events like droughts or floods, to the inherent instability archaeologists and anthropologists have documented in other chiefdom societies — a major flooding event could have been the proverbial last straw. “It would have had a particularly destabilizing effect after hundreds of years without large floods,” Schroeder says. 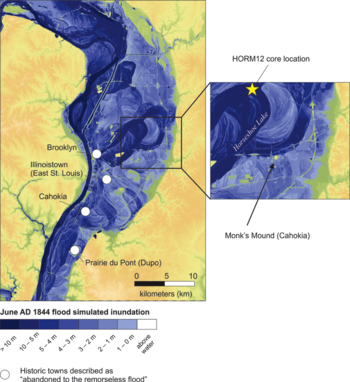 In order to deposit sediments into Horseshoe and Grassy Lakes, the Mississippi River would have had to rise 10 meters (about 33 feet) above its base elevation at St. Louis, according to models run in the study. This substantial flood would have inundated the region’s crops, impacted essential food stores, and created agricultural shortfalls. Food and other essential resources would have been currency in a civilization like Cahokia and could have been leveraged for political gains following a flood of the scale documented in the study. “We hope archaeologists can start integrating these flood records into their ideas of what happened at Cahokia and check for evidence of flooding,” says Munoz, who plans to continue studying flood records in lakes around the country once he graduates this year. The study also provides new information about the river’s behavior in the central Mississippi Valley, Williams says. Relatively little is currently known about its prehistoric flood cycle but the study suggests that major floods like those in 1844 or 1993 happened every century or two prior to European settlement and intervention, with the exception of the unusually arid years that facilitated Cahokia’s growth. The study was supported by the National Science Foundation, the National Geographic Society, the National Lacustrine Core Facility, The Geological Society of America, and through a Packard Foundation fellowship to study co-author David Fike at Washington University in St. Louis. Kristine Gruley and Ashtin Massie, both at UW–Madison, also co-authored the study.